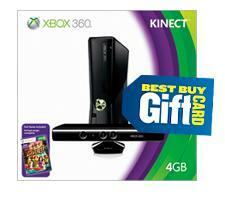 BestBuy.com is offering the XBOX 360 4GB Console with Kinect only $199.99 after the $100 gift card you will receive with the purchase. Plus get FREE Shipping & delivery by Christmas or order online & pick-up at your closest Best Buy store. This is the best deal I have seen for this XBOX 360 Package!